Me and my friend Slava "Foxon" Nosov, who is a big fan of Al, decided to promote Al in Siberia, to make more people know who he is, so we participated in Siberian Comic Con-2018 last Sunday. Slava cosplayed an old-school version of Al and did a great job on the stage performance , which I captured on camera (see the video below). I think that was the first time in the history of Russian cosplay when somebody portrayed Weird Al . We were very happy to discover that some people actually recognised "that parody guy" and some people who never heard of him just liked the cosplay so much, they decided to google more about Al! Here's my cosplay for a recent convention in Boston. The mask is his magnet set face blown up as a glossy print from Staples. I kept it perched on my forehead and brought it down to my face for photo posing. There was a speaker attached to the Squeezebox case via velcro. I had a Spotify playlist of any and all songs that were likely to be fun or ear-catching in crowds. I regret throwing out my old checkered Vans shortly before coming up with the costume though. What's not pictured is a sign I made in the middle of the convention attached to the back of my Hawaiian shirt. 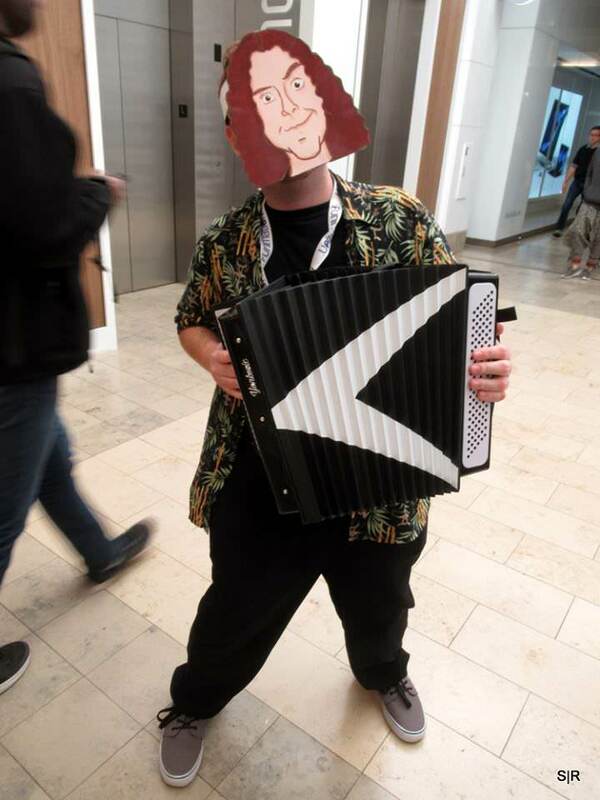 It sloppily reads "The Ridiculously Self-Indulgent, Ill-Advised "Weird Al" Yankovic Vanity Cosplay"
I'd love to know an easy comfortable way to carry the Squeezebox case without alterations. The velcro can be gently scraped off but it can't support straps comfortably. I like that cosplay, it's actually quite inventive... and a proof that you can do a good cosplay for the same money you'd spend eating at a fast food restaurant. As much as I have quite high standards as far as fictional, artificially generated (be it by a computer or by a pencil) character cosplays go, I think that cosplaying a real life person is more of a matter of catching the person's mannerisms and striking traits, because unless you do look like the person you're cosplaying, it will be easier for people to recognise you if you wear a cardboard mask than if you just dress like the person and use their "signature" accessories. Wait, so i can blow these magnets up to life size and print them out at Staples? Oh man is my wife gonna get mad at me!